Enter the Chapter Masters of the Master Houses! Collect an epic party of adventurers to go into the wilds to bring glory to your Guildhall! Now the Chapter Masters bring their experience to the quest for the Master Houses. 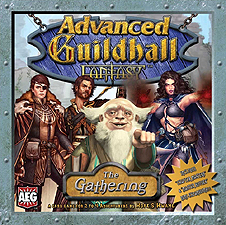 In Guildhall: Fantasy, 2-4 players compete to create the perfect party by recruiting adventurers into their Guildhall Chapters. Collect sets of cards with unique abilities to control the table, and complete a full chapter to claim victory cards. New Chapter Master act as wild cards with unique abilities and Master Houses provide extra benefits for completing your chapters! Go forth and bring glory to your Guildhall and your Guildmaster.